The front gates will be opened at 8:15 a.m. and will be closed shortly after 8:30 a.m.
For $10 we can post your student’s birthday on the marquee on the day of his/her birthday or Monday/Friday if it falls on the weekend. Cash or check is accepted, please make checks payable to Crestmont PTC. Please ask your student’s teacher for his/her student ID #. A $2.00 fee per payment transaction applies. here is no fee to set up an account to view balances. You may also pay with cash or check in the school office. Lunch at all grade levels are $3.00 and breakfast is $1.25. Students are supervised on the school campus from 8:15 a.m. to 3:15 p.m. Students should not arrive on the campus earlier or stay later unless they are a part of a supervised school activity. Please note that there is NO staff supervision of Kindergarten and TK students prior to the start of class. 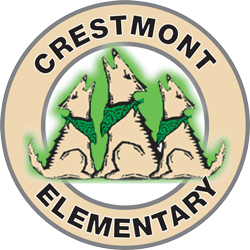 To view the Crestmont Handbook, please click on the attachment to the right.